Military Warrior Knife | BUDK.com - Knives & Swords At The Lowest Prices! Fight your way through the hordes of zombies with this Military Warrior Knife. Whether you’re slicing, stabbing or punching, this sturdy knife is up to the challenge. A 4 7/8” stainless steel blade is razor-sharp and offers a strong tanto point that is guaranteed to penetrate even the thickest zombie skulls. If you’re backed into a corner and a slicing or stabbing attack isn’t ideal, this knife also offers a metal knuckle guard that will deliver devastating blows to any zombie that tries to eat you for lunch! Carry this awesome knife on your belt with the included nylon belt sheath to ensure you’re always protected when things go south. The knife feels fairly comfortable in my hand & it feels pretty stout. There are some minor tool markings on the blade , the handle has some small imperfections & had to sharpen it a bit more but overall I am very satisfied with it, especially for the price. This was bought as a Hanukkah present as a replica of Carole's knife. But once I saw the price I had to get 2. They arrived super fast and were so well made that they've become fully functional daily knives. Fit good in the hand, I have larger than most hands. Knife was in pristine shape when it arrived on time, as in nothing loose or in any other way flawed. Blade needed some fine tuning for us picky folks but for a $10 knife it was great. This is a decent knife. Not a great knife or even a good knife,but it is a decent knife,especially considering the price. Very cool knife for the price. 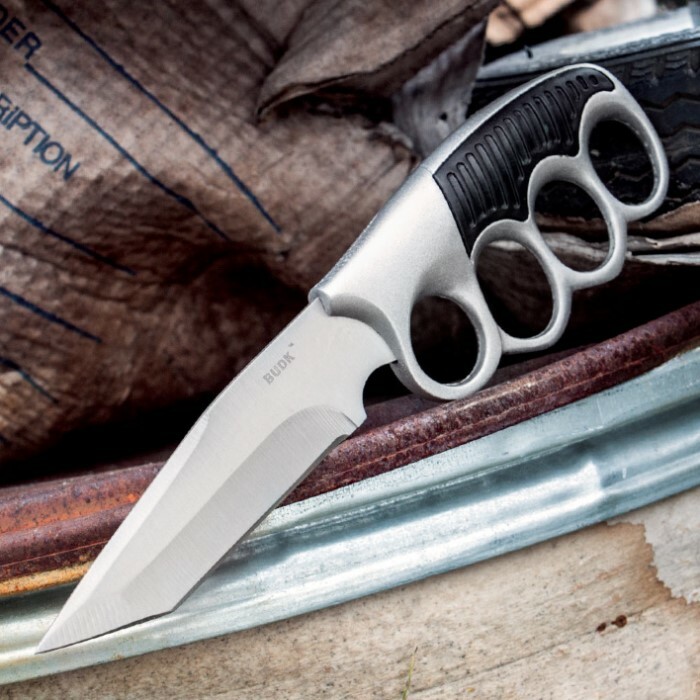 This is a quality knife with a cool one-two punch. I sharpened it up and carry it everyday which is really easy with the included sheath. 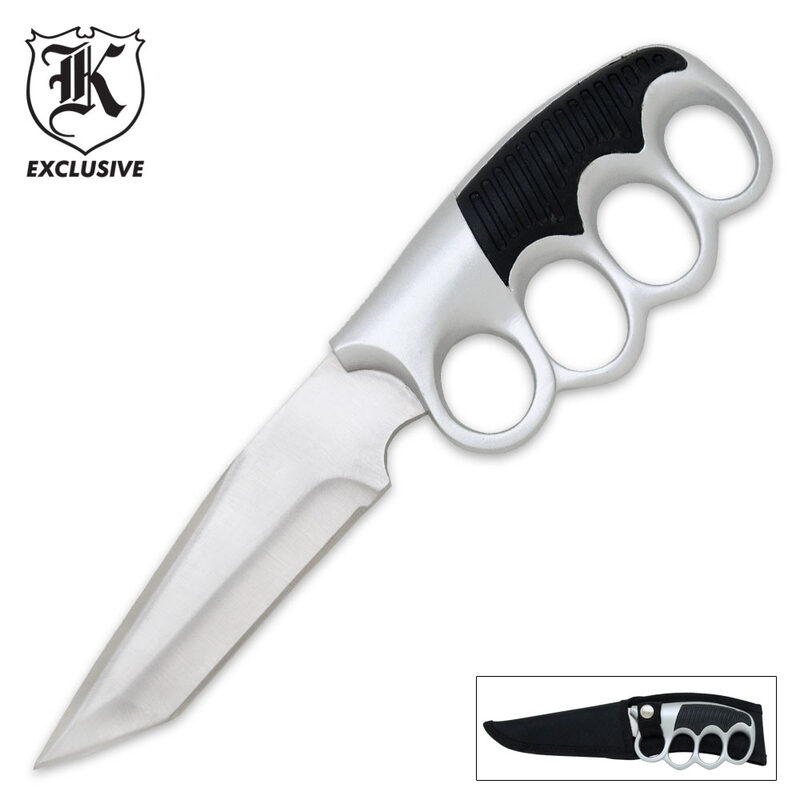 I read the reviews and saw some videos on youtube and knew I should buy this knife. I'm very satisfied! Saw it during the intro for The Walking Dead and had to have it. I haven't actually used it for anything other than admiring but it's seemingly well-made and pretty. 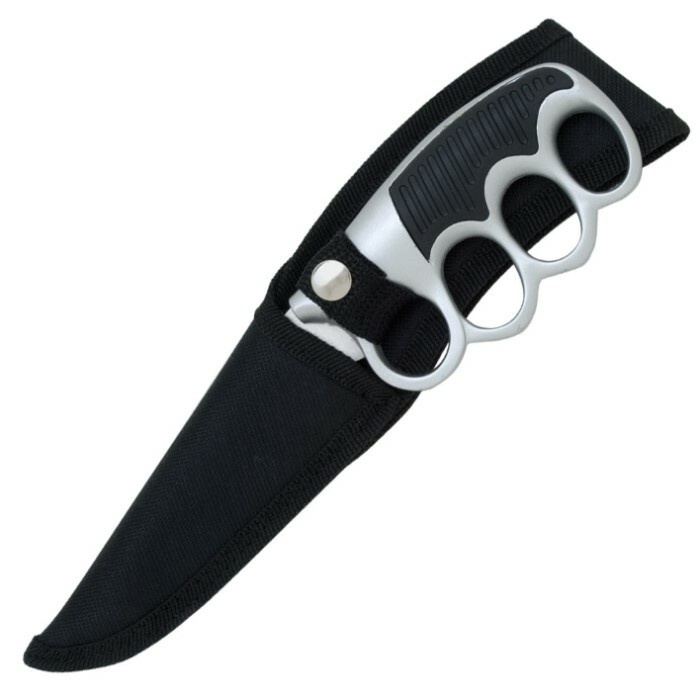 And you know if it were legal for me to even walk outside with it ("knuckles"), I'm sure it would be a great defensive weapon (if the blade is well-made). This is a great showpiece. I picked up a couple a few years back and they are still going strong. I keep one in my tool bag and I always seem to need a knife when I need some other tool. The other has been opening boxes whenever i get BudK mail or whatever. If you pay attention to TWD, Carol has used hers a few times in the first few seasons and If my memory halfway works, as late as season 4. As a display/replica model, not bad looking. The finish and lightness of the handle make it look and feel like plastic. The finger holes are weird; if I put my fingers all the way in to hold the knife, it hurts. If I put my fingers about 2/3s of the way I, it feels much better. The so-called grooves on the top of the haft, which is supposed to provide friction for the tip of your thumb in the classic saber grip are laughable. They are so shallow, they look like pencil marks. And the whole fastening thing, slipping the button through one of the knuckle holes, is really awkward. The blade came as sharp as the average steak knife and had tool marks near the tip. A functional blade? Nope. A display model? Yes. And as such well worth the price.